Disney princess culture is bad for girls but potentially good for boys, a new study suggests. 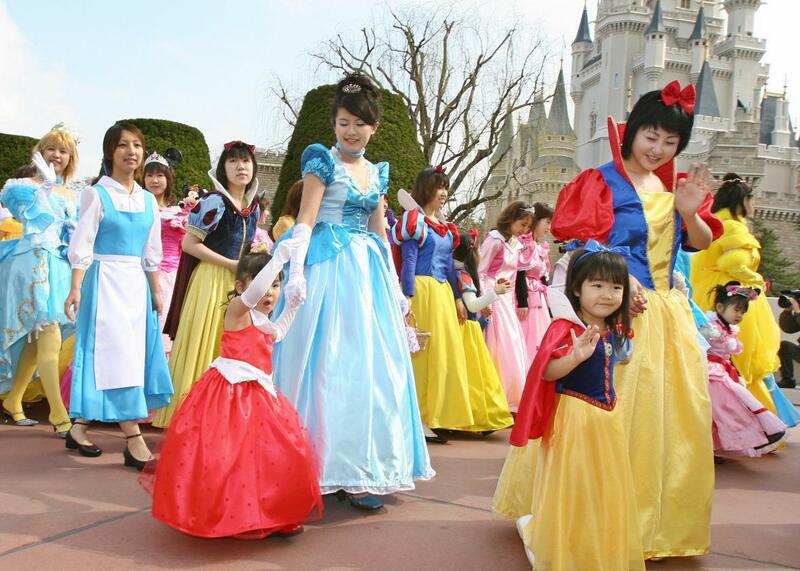 Girls and women dressed up as Disney princesses for a parade at the Tokyo Disneyland in March 2006. A new study has found an association between engagement with Disney princess culture and body image issues in young girls, confirming what many parents have long suspected. Girls and boys who consumed more princess media and played with more princess toys were more likely to display traditionally feminine behavior, researcher Sarah Coyne found, while boys who spent more time with princess stuff were more likely to have higher self-esteem. Published in Child Development, the Brigham Young University study analyzed the behavioral patterns of 198 preschoolers. Of the study participants, 96 percent of the girls and 87 percent of the boys had seen some Disney princess media in their lives; four percent of the boys and more than 61 percent of the girls used princess toys at least once per week. Coyne observed the children and noted the frequency and depth of their engagement with Disney princess products, then did the same a year later. Coyne’s measurements of princess engagement came from information provided by the preschoolers’ teachers and parents, and her means of assessing subscription to gender-stereotypical behavior was subjective and limited: The kids were asked to sort a bunch of gendered and non-gendered toys (tea sets, tool sets, and puzzles, for example) to indicate which they liked best. Coyne found that kids of both genders who consumed more Disney princess material were more likely to exhibit stereotypically feminine behaviors and preferences. That’s potentially worrisome for girls. “We know that girls who strongly adhere to female gender stereotypes feel like they can’t do some things,” Coyne said in a press release. “They’re not as confident that they can do well in math and science. They don’t like getting dirty, so they’re less likely to try and experiment with things.” But for boys, more time spent with princesses meant better body-image confidence and a higher affinity for helping other people. This suggests that the feminizing effect of princess culture is a much-needed foil for the kind of uber-masculine, violent, antagonistic superhero and soldier franchises typically marketed to boys. This study does not prove that princess culture necessarily causes these negative behavioral and self-image consequences. It could be that parents who encourage girls to play with a lot of princess toys encourage traditional gender norms in other ways, and that those who give their boys princess stuff to watch create home environments that nurture healthier notions of masculinity. It could also be that girls who gravitate away from those gender-stereotypical behaviors gravitate away from princess toys as a result, and the other way around. But parents do have an important role to play in a culture that makes princess culture all but unavoidable for little girls. Coyne has spoken with her daughter about the way one princess, Merida from Brave, was physically strong and defied gender norms in the film, but was made skinnier, less fierce, and more feminine in marketing materials. “Then we’re at the supermarket and see this ‘new Merida’ on fruit snacks and soup cans, and I point it out to my daughter and we have a conversation about the difference,” Coyne said in the release. “And now when we’re at the store, she’ll see the soup can herself and say, ‘That’s not the real Merida and I’m not buying it.’” A recent study found that kids more likely to develop body image issues and eating disorders if their parents make comments about the kids’ weight. Disney may be changing the literal shape of its princess culture—it’s most recent promotional images of Moana, the titular star of an animated film to be released this November, show the Polynesian princess with leg-sized legs and arm-sized arms. A brief trailer for the film shows her leaping and spearing something, a pleasant if violent departure from the demure ball-going of princesses yore. Still, since any Game of Thrones fan knows being a princess is no fun, young girls might be better off idolizing a kind of royalty that takes gender norms and exposes their malleability: the kings and queens of drag.